In my final Scottish Curler editorial of the season I stated that the Royal Club Masterclasses were an initiative that the RCCC had got right. 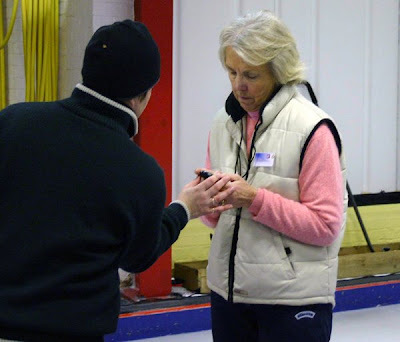 The objective of a Masterclass is to let club curlers experience something of what performance players are taught and learn during their training sessions. There were two last season. The first was at Kinross in December 28, described here. A second (see here) was held at the Lanarkshire Ice Rink, Hamilton, on January 27. Both were enjoyed by all who attended. I am pleased to see then that two more will be held next season. Curl Aberdeen will host the first on Saturday November 8, 2008. Have a look at what the day involves here. The cost is £30 and includes lunch. Registration forms can be downloaded. Ayr Ice Rink will be the venue for a second Masterclass on Sunday, December 7. Top: New RCCC Chairman Bob Tait (on the right) took part in the Kinross Masterclass, here listening to Tom Pendreigh. Above: Claire Milne helps Ladies Branch President Sheila Miller with her split timing. Photos by Bob. Colin Moulson is a Glasgow based optometrist specialising in 'sports vision'. This involves assessing the eyesight of elite sportsmen and women who then receive relevant advice on, for example, sight correction or eye muscle training. Colin worked with the Scotland and GB curling squads with Mike Hay before his departure to join the British Olympic Association. He has written an article about vision and curling which has now been published in Optician magazine online. Find it here to read online, or you can download a pdf file from the page, part of which is shown above. What do you think of Colin's findings and conclusions? A discussion thread is on the Scottish Curling Forum here. 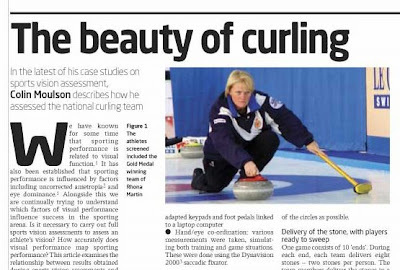 It was fitting that one of the GB athletes be the 'face' of the article, and the Scottish Curler was able to supply the photo of Rhona, by Hugh Stewart. Have you entered yet? The closing date for Scotland's main curling competitions next season is Monday, June 30. So if you want to play in the Columba Cream Scottish Ladies' Championship, the Bruadar Scottish Men's, the Scottish Juniors, Mini Tour Men, Mini Tour Ladies, the Scottish Senior Mixed, the Scottish Seniors, the National Masters, the Scottish Mixed Doubles, or the Henderson Bishop, then you have very little time left to get your team's entry to Cairnie House. Entry forms can be downloaded here, or you can contact the Royal Club HQ by phone or email (details here). Although the U-17 Slam events are already underway, teams can still sign up for the remaining four competitions. Monday is the deadline. The entries for the Scottish Mixed do not close until November 30, 2008, and for the new Double Rink Championship for club teams until July 30. It will be interesting to see how many teams enter for the various events. That will say something about the health of the competitive game in this country. There are unusual circumstances this season too. Clashes of dates with the World Universiade and the European Youth Olympics, and the fact that the Seniors' Championships are in New Zealand, with no guarantee of governing body help to cover costs, may see decreased entry numbers. Entries for the Scottish Ladies' Championship (formerly called the Gold League) continue to decline. This year there will not even be a qualifying competition. But one bit of good news. A new team will take to the ice! Mairi Milne, who last season played fourth stones for Edith Loudon, takes the head now, with her sister Claire at third, Katie Loudon as second and Lynn Cameron as lead. Curling Today is not usually one for predictions but I will be surprised if this team is not up there challenging Team Wood and Team Munro! I look forward to the first round of games in this event - at Curl Aberdeen, November 21-23. The full competitions calendar is here. Mairi Milne at the Gold League finals last season by Bob. In the greater scheme of things for most curlers, today's announcement by the World Curling Federation (here) probably won't have much significance. But I found it very interesting! And it could have far reaching consequencies. Curling's world governing body has linked up with Infront Sports & Media to be the 'Official Marketing Partner of the World Curling Federation'. Way back in December (here) Curling Today indicated that this was in the offing. Infront is based in Zug, Switzerland. It is a private organisation with over 400 employees and offices in eleven countries: Switzerland, Austria, Finland, Germany, Italy, Norway, Sweden, France, South Africa, Singapore and China. You will note that there is no presence in Canada, nor indeed the UK. So what role will Infront play within the sport? Attracting sponsorship and maximising income is the key role. For example, Infront will market packages for sponsors, utilising exposure opportunities such as in-ice advertising, or stadium and venue advertising and combining these with official sponsorship status and designations, and the use of marks, hospitality and promotional opportunities. The main events included in the contract are the Men's and Women's World Curling Championships and the European Curling Championships. We can take it from this that there has been co-operation with the European Curling Federation in working towards this agreement. The contract is for three years in the first instance. That of course covers the Aberdeen European Championships. Other events such as the Juniors, Seniors, Mixed Doubles and the European Mixed are also covered by the agreement and it will be interesting to see if Infront has plans to raise the profile of these competitions. Also how the WCF agents can work alongside the local organising committees in attracting and sharing benefit from the sponsorship that is attracted. Infront's role covers the exploitation of all media and marketing rights worldwide. Of course, there are existing agreements, and the press release notes that these are 'being reviewed with the partners concerned'. The WCF has an existing contract with the Canadian Curling Association, which has been the Canadian marketing representative for many years, and of course currently delivers title sponsor Ford of Canada for World events in that country. The current contract was renewed last year for a two-year term. Also in Canada, TSN remains the official WCF broadcast partner in an agreement that is in place until 2014. The production of the television feed for worldwide distribution will continue to be handled by the WCF, through its own WCTV. The full text of the press release contains quotes from WCF President Les Harrison, and Infront President and CEO Philippe Blatter. In addition Bruno Marty, Executive Director Winter Sports, who will be responsible for the operational aspects of the new relationship, says, "We are looking forward to working with the World Curling Federation to give curling a strong base for future expansion. The sport has a lot to offer to both commercial and broadcast partners and it is our aim to unlock its full potential." If you follow The Curling News blog, you will know that Editor George Karrys is a fan of the Weakerthans, a Canadian indie rock group. Has GK's musical tastes got any relevance to Curling Today on a rainy Sunday afternoon in June? Most certainly. I bet you smile when you watch the recently released video for their song Tournament of Hearts. Altogether now, "Right off, no never never ever ever!' The full lyrics are here. This is the equation: O + (N x S) + Cpm/T + He, where O is time spent outdoors, N is time spent in nature, S is socialization in the summer, Cpm relates to positive memories of childhood summers and T is temperature. Happiest day of the year? That was today (June 20) according to Cliff Arnall, a Welsh psychologist. You may remember him from his 'work' on Blue Monday ie January 21 this year which he described as the most depressing day of the year (actually that was last Saturday's RCCC AGM, but I digress). Arnall has come up with the above formula to determine the best day of the year. How was it for you? I had a great day. I visited the Royal Highland Show at Ingliston. My enjoyment of course really had nothing to do with Arnall's nonsense! Ingliston of course is where Cairnie House, the headquarters of the Royal Caledonian Curling Club, is located, and of course a warm hospitable welcome awaited members, as well as anyone interested in finding out more about the sport, who stopped by. When I was there today, the stand was being manned by Matt Murdoch, RCCC President and Ladies' Branch President Sheila Miller, both kept in order by Claire Milne (Perthshire and Dundee ACDO), Judith McFarlane (Development Manager), Lynne Robertson (National Coaching Officer) and Sheila Swan (National Disability Officer). Coffee was on offer with home baking (courtesy of Jenny Stark), and there was even something stronger, courtesy of Scottish Championship sponsor, the Scottish Liqueur Centre. Zander McIlwham of Curling Supplies was on the stand too, with a selection of curling equipment. I met Emma Sunderland, the Royal Club's Communications and Marketing Officer, who has taken over from Annette Williams who is on maternity leave. That's Emma on the left. There was one other pleasant thing I had to do, yet sad too, and that was to say goodbye to Duthie Thompson who is leaving the governing body after fourteen years. He served firstly as Secretary/Treasurer and then latterly as Manager of Finance and Administration. Happy retirement Duthie! One other curling encounter in the Show was in the Handicrafts Competition. 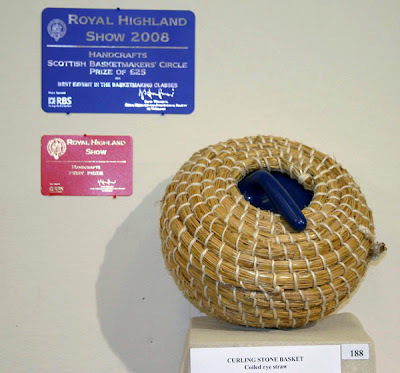 In the class for a traditional basket (any basketmaking technique), Bryce Reynard from Inverness won first prize for his reproduction of a curling stone basket, which were used to transport your stones to games outside a hundred years or so ago. 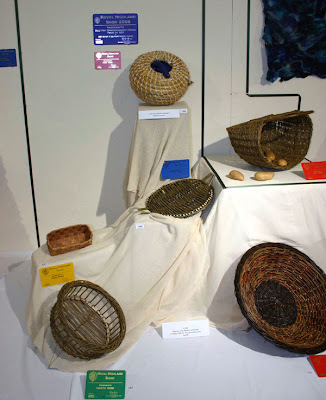 For his efforts on such an unusual subject Bryce also won the Scottish Basketmakers Circle Prize. Yes, it may not have been the happiest day of the year, but it was a good one! 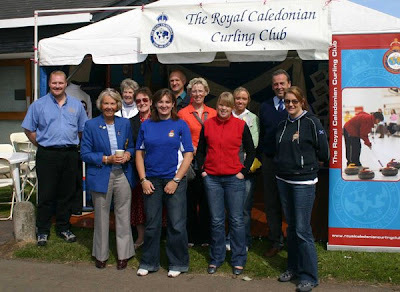 Top: The Royal Club stand outside Cairnie House at the Royal Highland Show. Above: Emma Sunderland; Duthie Thompson; the display of baskets in the Handicrafts Competition; close up of Bryce Reynard's winning curling stone basket - complete with a modern handle! 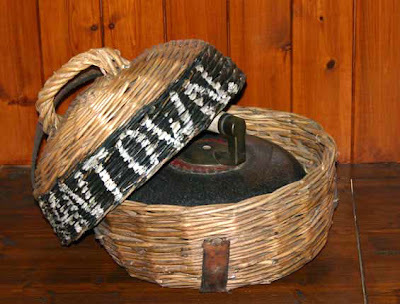 ; An original basket with stone which is in the collection of the Highland Folk Museum at their reproduction of a curling hut at Newtonmore. Photos by Bob. David Edwards and his team of Moray Combe, Gavin Fleming and Graham Sloan have belatedly been included in the Royal Club's National Academy Squad, see the post on the Royal Caledonian Curling Club's website here. When the athletes selected for the Squad were named last month (see here), several names were missing. The Edwards team lost out in a tiebreaker for fourth place in the Bruadar Scottish Championship last season, and many thought that such a good performance deserved Royal Club support this season. Today's announcement indicates that others agree, and that funding is now in place for them to be included. That brings the National Academy Squad teams to eight. David Edwards' pic is by Bob. Study the photos! They illustrate a practice which has now been identified as inappropriate in the sport of curling. I apologise to those in the pics, as I don't mean to single out these potential 'offenders' from the many in Scotland last season, from Juniors through to Masters. But the photos illustrate a new rule which was passed at the Royal Club AGM last Saturday. It replaces the rule which said, "No player shall use footwear or equipment which may damage the surface of the ice." The new regulation says, "No player shall cause damage to the ice surface due to equipment, hand and/or body prints." Taking photos of curlers and curling this past season I have seen fingers and hands on the ice frequently. And those that play at the highest level now recognise that this can damage the pebble, leading to an increased number of picks, the scourge of the game. 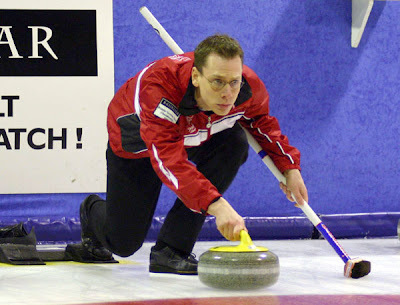 Curling's administrators have moved to legislate against the practice. The new rule has now been adopted for Scottish curling, and Colin Hamilton, the Royal Club's Competitions Manager, has confirmed that the regulation will also be in the new World Curling Federation rulebook, which is eagerly awaited but has yet to be published. So, if you offend, what are the sanctions? They are severe. The RCCC rulebook now says, "A player may be ejected from a game if continually breaking this rule: see 6 (b) under Royal Club Competitions General Rules and Conditions Dispute & Discipline." It will be interesting to see how stringently the umpires in Scotland and at International events will enforce it! Will we see players being sent off next season? Top: Ice technician of the year Tom Brewster, and Mary Barr. Above: Claire Hamilton, Kirsty Letton, and Warwick Smith. Photos by Bob Cowan and Richard Gray. The Royal Caledonian Curling Club's Gala Dinner was held at the Westerwood Hotel, Cumbernauld, on Saturday. Presented then were awards which recognise the achievements of those involved in curling during the 2007/2008 season. Bill Nicol and the Moray Province Development Group. 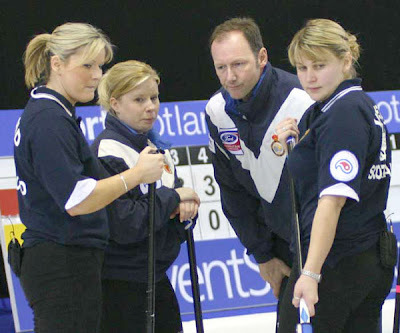 The David Murdoch team was considered to have made the most significant contribution to the sport of curling during the 2007-2008 season. David Hay was the coach who was considered to have made the most significant contribution to a team during the 2007-2008 season. Coach of the Year, sponsored by Curling Supplies, was won by Albert Middler. 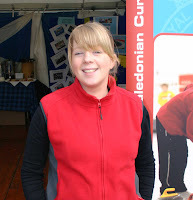 The young curler who attracted the most votes and supporting evidence for his or her performances throughout the 2007-2008 season was Eve Muirhead. Ice Rink Manager of the Year sponsored by Ferguson Oliver was won by Tom Brewster of CurlAberdeen. 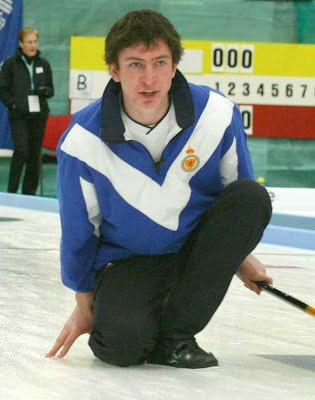 The Ice Maker who continually produced good quality ice in a rink whose main purpose is for curling over the 2007 – 2008 season was Tom Brewster. This award was presented to the ice maker who continually produces good quality ice in a rink which was used for various reasons including curling during the 2007 - 2008 season. John Heron and John Marr of the Waterfront collected this award. The award to the journalist/writer/enthusiast whom the members consider had provided excellent coverage either nationally or regionally, via newspapers, magazines, internet, videos or television. This went to yours truly. I suspect the reason was the success of this Curling Today news blog, in support of the Scottish Curler magazine. My thanks to all of you who read it regularly, and to those who voted! 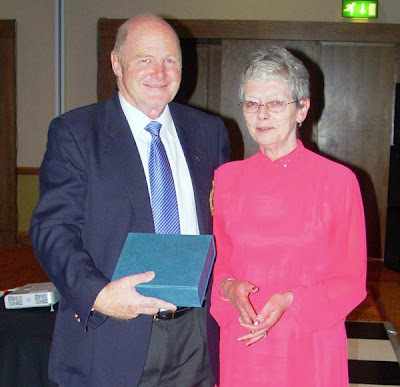 Hugh Stewart's photo is of Bill Nicol with Christine Stewart, the Scottish Curler's depute editor. 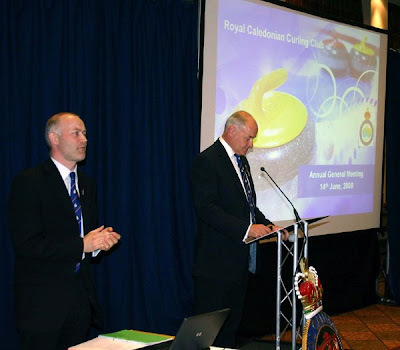 The one curler one vote resolution (see here) failed to gain the necessary support at the Annual Meeting of the Royal Caledonian Curling Club at the Westerwood Hotel in Cumbernauld today. Although the majority of clubs (seventy of them) voted in favour of the motion, thirty-five did not, and, the required 75% not being reached, the motion failed. Note the figures. Only 105 of Scotland's 570 clubs were represented at the meeting to vote on such an important issue. Such is the democratic process within our governing body. Apparently, the overwhelming number of those playing curling in this country care nothing about the politics of the sport! However, the few that took the time and effort to be at Cumbernauld certainly saw the diversity of opinion that exists today amongst members about the future. There was much discussion about the consultations of the Representative Review Working Group. Opinions on the future makeup of the Royal Club are becoming polarised. I'll return to this in a future post. Suffice to say here that members have until August 31 to contribute to the consultation process. On an happier note, a vote to allow Bill Marshall to be elected as the Club's Vice-President was passed, and Bill was duly elected. Matt Murdoch is the incoming President, elected unopposed. Willie Nicoll joined the Board as a new Director. He and Jeanette Johnston (now elected for a second term) were the only candidates for the two vacant positions on the Board. 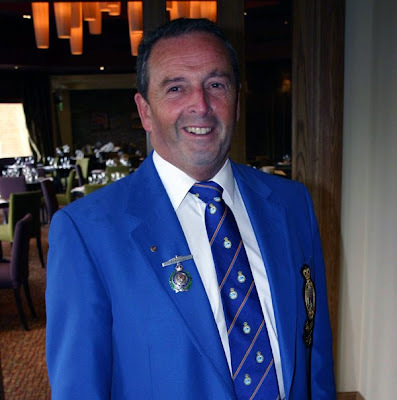 The Board duly met after the AGM and elected Bob Tait as their Chairman, see the post on the Royal Club website here, and Bob's pic with the old Board is here. So what else happened? A proposal to increase the subscription by one pound from £16 to £17, was passed, but not before a counter proposal for a two pound increase, to enable more support to be given to senior teams competing in the World Championships, was defeated. Eve Muirhead and her World Junior Women's Champions were on hand, and should have received their commemorative banner from the World Curling Federation. But it was not at Cumbernauld. Apparently the Royal Club was sent the one meant for Chris Plys and the winning junior men's team from the USA. Oops. Nothing like a simple mixup to raise a smile though! Calling the USCA - can we do a swap? It fell to retiring Board Chairman Mike Ferguson to talk a little about Vernon. We learned that yes, a conduct panel had met last Monday, and the Board has received a report. What does that say? We were not told. This is what Mike said at the AGM: "There has been much interest on the events surrounding the Women's World Championships in Vernon. Whilst we empathise with all involved, we fully appreciate that the membership also want comment. Unfortunately as we are still in the procedural stage, our hands are tied and we simply can't go into detail. At this moment, on the 9th of June the conduct panel heard procedural hearing. The morning the Board received a communication with observations on the process. The Board will consider this at the earliest opportunity. As I say, I appreciate that on face value, the apparent lack of action may appear unsatisfactory. However I hope you can understand the position we are in and the challenges we face in resolving this in a satisfactory yet compliant manner." Top: Blue skies over the function suite at the Westerwood Hotel for the Royal Club AGM today. Mike Ferguson (right) and Colin Grahamslaw jointly chaired the meeting. Below: New Board Director Willie Nicoll and new President Matt Murdoch. Photos by Bob. At March 31, 2008, there were 12,637 of us - full members of the Royal Caledonian Curling Club! The figure has fallen in the five years since 2003, when there were 13,836 registered members, but the decline seems to be slowing (last year the membership stood at 12,791), thanks no doubt to the Come and Try initiatives and the work of the Area Development Officers. Junior membership has increased from 797 to 862 in the past year. Why I mention this figure today is that come Saturday all these full members could have a direct say in the organisation of our sport. 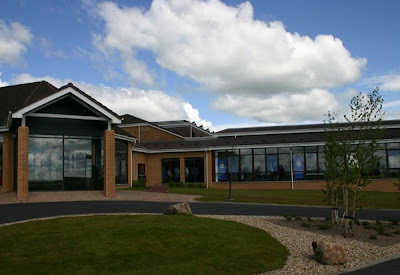 At the AGM of the Royal Club at the Westerwood Hotel in Cumbernauld, there is one very important item on the agenda, and that is 'To introduce measures giving individual registered curlers the right to vote at General Meetings and in Elections for the President, Vice President and Directors'. One of the outcomes from the deliberations of the Representational Review Working Group has been to propose the introduction of ‘One Curler, One Vote’. The Group and the Board believe that this will give more of a say in the running of the Royal Club to individual curlers and allow them a direct input into the decision making process. The changes proposed will also allow the casting of votes by post or by proxy. Currently, the membership is represented by votes carried by a representative of their club. Each club, no matter how large or how small, has one vote. Most can't even be bothered to send a representative to the AGM. Last year only 104 of the country's 568 clubs were represented at Glenrothes. In practical terms, individuals will receive two mailings each year, one at the start of the season with their membership card, replacing the members' brochure mailing, and one in May with the AGM notice, annual report and voting papers. This is not expected to cost significantly more than the two mailings which were sent to the membership last year. Ironically, 75% of the representative members who attend on Saturday will have to vote in favour of the change for it to happen. Will the proposal be adopted? Many think not. Curlers are notoriously conservative. A least one Province has encouraged its clubs to vote against the motion. The one member one vote may well turn out to be a vote of confidence in the Royal Club. Regardless of what happens on Saturday, the Royal Club has a difficult future. There are a number of issues outstanding. Not the least of these is the ongoing problem of representation - and the concept that there should be just one Royal Club Standing Committee, doing away with the current Ladies' Committee structure. Much discussion and consultation has yet to take place on this and, although it is bound to be mentioned on Saturday, there will be no recommendations put to the members this time around. Then there is the Vernon issue, and the apparent lack of action by the Royal Club to investigate this, to find out what went wrong, what lessons can be learned, and what needs to be changed to ensure that such a situation doesn't happen again. What happened when a conduct panel convened last Monday? Will we find out on Saturday? The purchase of the Lees painting has not been completed, and members await an update on this. Currently it is on loan to the National Galleries of Scotland who are still trying to raise the money to buy it. Then of course, no-one wanted to be Royal Club vice-president. Thankfully at least one name has come forward, that of Bill Marshall (see here). But he will only be elected if the membership votes to allow his late application to go through. Matt Murdoch will be elected unopposed as the Club's President. It may be the final time in the spotlight for Mike Ferguson, the Board Chairman, who stands down on Saturday after heading up the Board through its first few formative years. The Annual Report of the Royal Club can be downloaded from the Royal Club website here. The GB wheelchair curling squad were at Inverness Ice Centre at the weekend for a training session, both on and off the ice. Hugh Stewart's photo shows L-R Jim Sellar, Rosemary Lenton, Michael McCreadie, Aileen Neilson, Tom Killin and Angie Malone outside the Inverness rink. The Olympic and Paralympic squad names were announced by British Curling on May 1, see here. There's another photo of the squad on the ice here. The final squad selection will be made in May 2009 for the run up to the Paralympic Games in Vancouver, March 12-21, 2010. 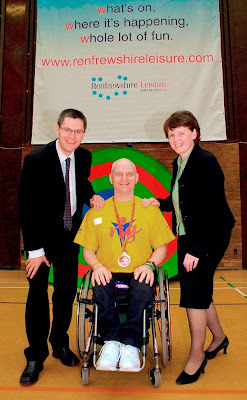 We reported a year ago (here) how Royal Club Area Development Officers Judith McFarlane and David Horne got involved in the inaugural Renfrewshire Special Games whose function is to promote the education and welfare of children with physical, sensory or learning disabilities through sport. 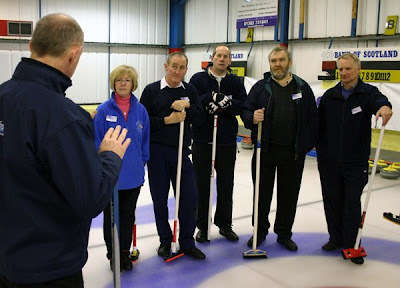 This year David was back with leave from the Braehead rink, where he is the ACDO, to head up a group of volunteer curling coaches to run an indoor curling station at the event. He recruited several Braehead volunteer coaches including Michael McCreadie who is also a former wheelchair world wheelchair curling champion. Michael was 'well chuffed' to be asked to officially open the games! More than 400 children with physical, sensory and learning disabilities took part in the Games at Linwood Sports Centre. This year the games were expanded into a three day festival of sport to accommodate the increase in competitor numbers which was up by nearly 40% on last year's event. The competitors were drawn from across Renfrewshire's schools, including Kersland School, Clippens School and the Mary Russell School. Over the three days, Linwood Sports Centre played host to a variety of sports including new age kurling, golf, football, netball, athletics, martial arts, dance, badminton and boccia. Councillor Lorraine Cameron, convenor of Renfrewshire Council's education policy board, said: "We are delighted to be able to build on the success of last year's inaugural Renfrewshire Special Games. This event gives our young people, who have a disability, the opportunity to take part in a range of sporting activities led by qualified and experienced coaches. They have a chance to try a whole variety of activities and find an activity which they like and are good at, and which are accessible for them in the community. This event is a great way of raising the profile of sport for young people with a disability in Renfrewshire and is run in partnership with a number of community groups which provide essential support and voluntary staff from University of West of Scotland, the Royal Caledonia Curling Club, Renfrewshire Leisure Ltd, Kilbarchan Amateur Athletics Club, St Mirren Football Club and Clippens School Parent Support Group." Michael McCreadie photo (below) courtesy of David Horne. On the left is Councillor Derek McKay (Leader of Renfrewshire Council) and on the right is Patricia Cassidy (Leisure and Cultural Services Manager). Last month, I asked Royal Caledonian Curling Club CEO Colin Grahamslaw, "Can you expand on how the RCCC will help British Curling in 'running the British team for the EYOF''', this statement having appeared in the Board Minutes. His reply then was, "Not really, as we have not made final arrangements yet – but I would expect that it would be the same as last time where the Royal Club ran the programme on behalf of BC." Things have obviously moved on somewhat, to judge from the post on the Royal Club website today, here. The RCCC is now looking for young curlers to represent Great Britain at the European Youth Olympic Festival in Slask Beskidy in Poland between February 14-21, 2009. The event website is here. How does the event fit in to a crowded calendar next season? It follows the Scottish Junior Championships, and is before the Junior Worlds. It overlaps with the World University Games in Harbin. Britain has a guaranteed place for a girl’s team, for which five members are required. To be eligible, curlers must have been born between July 1, 1990, and June 30, 1992, and have a full British passport. A boy's team is on a reserve list. Presumably the eligibility for the event is dependent on placings at previous World Juniors. The Royal Club is also looking for an experienced coach to work under the direction of British Curling and the British Olympic Association, to prepare and manage the girl’s team (and possibly a boy’s team) for the event! Applications should go to Rhona Martin at Cairnie House by the end of this month. As for the event itself, some background can be found here. The European Youth Olympic Festival is a biennial multi-sport event for youth athletes from the forty-eight member countries of the Association of European Olympic Committees. EYOF's summer games were held for the first time in Brussels in 1991, and a winter edition began two years later in Aosta. Currently the sports that are included in the winter games are downhill and cross country skiing, biathlon, nordic combined, ski-jumping, snowboarding, figure skating, ice hockey, and curling. The curling venue for the 2009 EYOF is interesting. A special rink has been built and the Polish National Junior Curling Championships took place in the arena at the Bielsko Mechanic School, as a trial event for the EYOF. Installing the rink began only two weeks before the competition was held. The school's sports hall was covered with special refrigerated mats, on which the ice for the curling rinks was laid. Now, I want you to study the above photograph carefully. OK? Now answer the question, "Where do you think would be a good place for a sponsor's logo?" Well, the World Curling Federation has tackled this thorny issue (it's a tough job but somebody had to do it), thought long and hard, and adopted new cresting policies. The European Curling Federation has adopted these for its upcoming Mixed and European Championships. They are outlined here. Until recently, the positions that were allowed were the left chest and upper and lower right arm for team sponsors' crests and Member Associations' emblems. That's three. The right chest and upper left arm were reserved for the event sponsor of the European Curling Championships (ECC or EMCC), or an event crest of the Host Committee. That's two more places. Right, go back to the photo. Study it carefully again. Where is the new (sixth) place that a sponsor's logo can go? Yes, you're correct! It's the SIDE OF THE LEG (between the knee and ankle) which is now reserved for a team sponsor’s crest. According to the new regulations, "All team members must wear the crest on the same leg and the crests must be at the same height." I can just see the umpires with their tape measures already. But should it be on the inside, or the outside? And size matters. A crest shall not be greater than 10cm (4 inches) edge to edge, or not greater than 100 square centimetres (16 square inches). I wonder if this company would like to sponsor a team, who undoubtedly would have to promise not to put the logo on their right legs! Thanks to the model curler in Bob's photo above. Special prize to anyone who can identify where it is and who it is! A last thought for a Monday. How about sponsored socks? Now here's something you may not know. 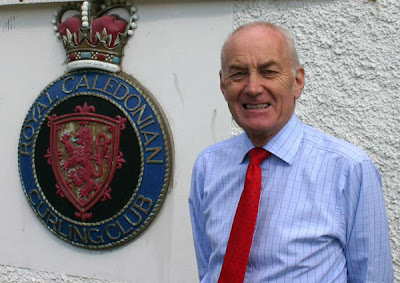 Former National Curling Coach Mike Hay MBE is now a member of the Board of sportscotland. 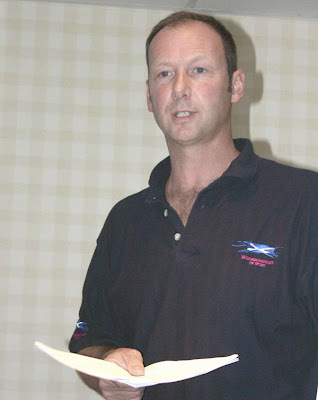 You will remember that Mike left the Scottish Institute of Sport in October 2006, after eight years, to join the British Olympic Association as Olympic Performance Manager for Winter Sports. He became a board member of the Scottish Institute of Sport in September 2007. The Scottish Institute of Sport controversially 'merged' with sportscotland earlier this year. The original note about that is here. Institute chairman Dougie Donnelly was 'stood down', and sportscotland chair Julia Bracewell also lost her job in the reorganisation. Louise Martin CBE, an existing sportscotland board member, was announced recently by the Scottish Executive as the new chair of sportscotland, a popular choice. Mike Hay is on the Board of the new merged organisation. 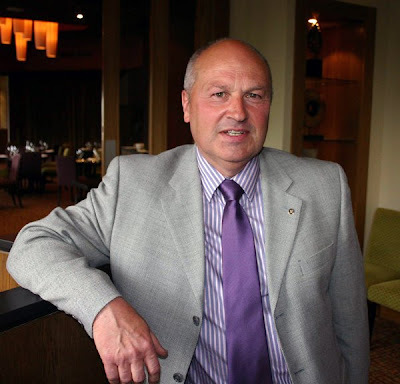 A couple of months ago Mike was asked along with Sir Bill Gammell and Louise Martin, former Scottish Institute directors, to take places on sportscotland's new Board of Directors. He has attended one meeting so far and is due up in Scotland at the end of the month for another. He says, "It's obviously a challenging time with all the changes that the Scottish Government has made, but therein lies opportunities for all of us to make positive changes. Winning the bid for Glasgow Commonwealth 2014 will give huge focus for sport in Scotland in the interim period." We wish Mike best wishes in this new challenge. Want to be in Vancouver? Tickets for the Men's and Women's curling competitions will be allocated to various National Olympic Committees who will contract a ticket agency in their own country to distribute these. Although tickets will not be available until October 8, 2008, registering an interest now is recommended. For information and tickets in Great Britain the contact is Sportsworld Travel, Windrush Court, Blacklands Way, Abingdon, OX14 1SY. Phone 01235 554844. Paralympic Winter Games ticket package information should be obtained directly from the VANOC website (www.vancouver2010.com). Top: Mike Hay in action in his days as National Coach. Photos by Bob. Above: The Hillcrest stadium where the Olympic curling will be staged in 2010, under construction at the beginning of April this year. It is due to be completed by the autumn. When the games are over it will be turned into a community centre with a public library, skating rink and will be home to the Vancouver Curling Club. Photo by Hugh Stewart. Team Europe has become Team World for this year's Continental Cup which goes ahead December 18-21 in Camrose, Alberta. The event website is here. The competition will feature six World teams (three male and three female) against six North American teams. Previously known as Team Europe, Team World will include two squads from China for the first time. 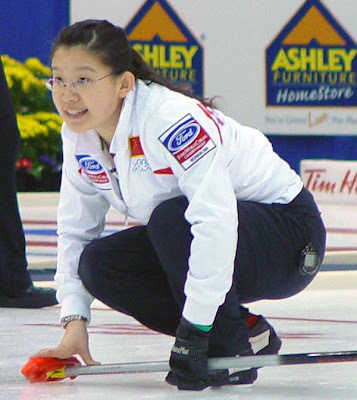 Bingyu Wang (above) skipped her women's team to a silver medal at the 2008 Ford World Women's Curling Championship in Vernon, Canada, last March while Fengchun Wang's foursome finished fourth in their international debut at the 2008 World Men's Curling Championship in Grand Forks, USA. David Murdoch of Scotland, Thomas Ulsrud of Norway, Anette Norberg of Sweden and Mirjam Ott of Switzerland, make up the World squad. Make sure you note who will be team captain and team coach! Paal Trulsen of Norway is the captain while Sweden's Peja Lindholm, a three-time world champion skip, will be coach. "I am honoured and excited by this challenge," said Lindholm, who retired from competition in January. As a former player, three times, in the Continental Cup, I know how special it is and I look forward to coming back again. I know Paal really well and he knows me. We are good friends and we respect each other. We also shares the same values so I am sure our teamwork will be excellent." Now, a personal comment from me! I've been criticised for calling it a charade (see a previous Curling Today post here). The curlers enjoy it, definitely. But what is it doing to promote curling in Europe, as I asked before? Is the WCF getting value for money for what it spends? I think it's great that it now encompasses teams from the Pacific region. But is an event like the Continental Cup the future for our sport? I remain to be convinced. If we could only get to see some of the play of what is, after all, a made-for-television event, then perhaps my opinion might change! 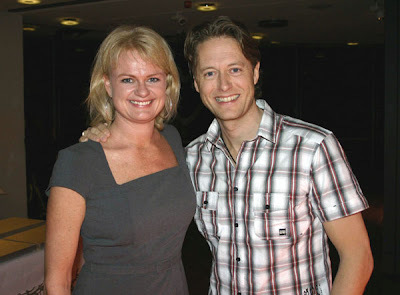 Above: Two Swedish curling legends, Anette Norberg and Peja Lindholm, entertained guests at the VIP dinner at Ostersund during the World Junior Curling Championships in March. Photo by Bob. I must say that I like Mixed Doubles curling. 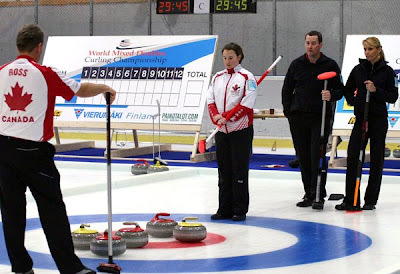 I enjoyed the Scottish Mixed Doubles Championship at Murrayfield last season, and I was fascinated with the inaugural World event at Vierumaki. Concerns that it would not be fun to watch were quickly dispelled, and I am really glad I was there. Curling Today has already flagged up (here) that the second World MDs event is headed for Cortina d'Ampezzo in Italy next April. The official WCF press release was issued today. Find it on the WCF website here. It's a long way off yet, and the number of countries entering will not be known until November. Last time twenty-four countries took part. There could well be more in Cortina! The event will stand on its own next season. In Vierumaki it ran alongside the World Seniors, particularly difficult for the ice crew and the organising committee. Interesting to note that the Italian venue will host the World Men's Championship in 2010. Photos of curling in Cortina, and of the Stadio del Ghiaccio, can be found on the Curling Cortina website here. Top: Canada v Hungary at Vierumaki. Bob's pic. The full draw is on the event website here. Twenty-three countries will contest the title, playing initially in three groups. Countries have been allocated to groups based on last season's results. The playing system is on the ECF website here. The top team in each section qualifies for the semifinals. The DSC results (now the aggregate of all the Draw Shot Distance results) decides the ranking of winners of the three groups. The fourth placed team is decided as follows. After the second team in each group is determined, the three are ranked by the DSC. The second plays the third, the loser of that game finishing overall ranked sixth. The winner of that game plays the first, the loser has a final ranking of fifth, and the winner qualifies for the semifinals. For the semis, 1 plays 4, 2 plays 3. Winners go to to the final. Losers contest a bronze medal game. 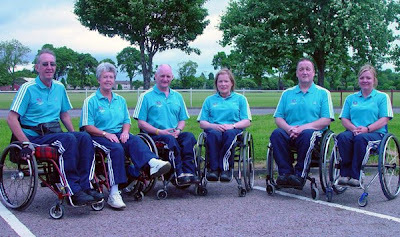 Scotland will be represented by Alan Smith, Gillian Howard, David Mundell and Karen Strang who won the Scottish Mixed Championship in Aberdeen in March (see here). The British Curling squad for the World University Games, in Harbin, China, February 18-28, 2009, was announced recently (see here). Andrew Craigie, John Hamilton, Glen Muirhead and Thomas Pendreigh were selected as the men's team. The news today (here) is that Glen has withdrawn from the squad. The reason given is that he is already heavily committed to competitive curling with his own team in the Juniors next season. This team will go to Taarnby in January for the European Junior Challenge, to try to qualify Scotland for the 2009 World Junior Championship. 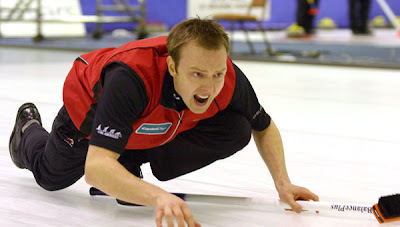 Glen feels with this commitment to curling he needs to have some time available for his university studies. Hence his decision to leave the WUG squad. 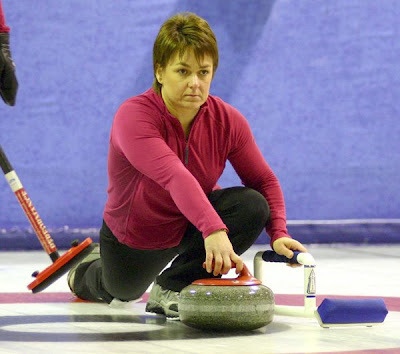 High Performance Curling Coach Cate Brewster is now looking for two more athletes to complete a squad of five. The BC announcement says, "Candidates will be selected on recent statistics and results." To be eligible, athletes must be students and under the age of 28. There is already an interesting thread about the WUG, including comment on the commitment required, on the Scottish Curling Forum here. I have not found it easy to make sense of what has been happening in the past two months. But an update is overdue. Here is my, probably inadequate, attempt at an explanation. National coach Derek Brown, who was in overall charge of the Scottish squad at the Ford World Women's Curling Championship in Vernon, British Columbia, in March, will face a Royal Club 'Conduct Panel' next Monday. This results from the complaint lodged against him by Gail Munro and Lyndsay Wilson, who were initially blamed by Brown for the fiasco which saw Scotland field just three players for the last two round robin matches in Canada. Brown had lodged complaints against Munro and Wilson, and the two women will also face a 'Conduct Panel'. The investigation into the complaints has been led by Frank Gill, a lawyer with Anderson Strathern, who was asked to take this role as the 'responsible officer', as RCCC Vice-president Matt Murdoch had to declare a conflict of interest (see previous post here). RCCC's policies and procedures for an ethical sport'. There is a section therein which relates to 'Policy and procedure for dealing with the conduct of participants'. There is no precedent. Nothing like this has happened in recent years. Gill had to decide whether the complaints had merit. If so he had two choices - either to investigate further, or that 'disciplinary action against the participant is warranted', in which case he had to call a formal hearing or 'Conduct Panel'. He has apparently decided on the latter course of action. Note the use of the words 'disciplinary action' here. I find this strange. It implies that Gill, acting as the RCCC's responsible officer, has already acted as judge and jury and that both parties are 'guilty' of something. However the role of the Conduct Panel is wide ranging to investigate the complaints. It would appear that everything is still at an investigation stage. Witnesses can be present or submit written evidence to the Conduct Panel. Gill's last act has been to select the members of the Panel from a list of qualified individuals made up from curlers, Board members, Area Standing Committee and Ladies Standing Committee members. His choice to take things further are Sheriff Richard Scott (formerly Sheriff of Borders and Lothians at Edinburgh, and founder member of Abbotsford Curling Society), Ewan Malcolm (a lawyer, now with Consensus Mediation and a former Murrayfield coach) and Pam MacKay (director of curlingshoes.com, a well respected curling supply business). That's Gill's job over, apparently. When the Conduct Panel has finished its investigation it can apply wide disciplinary sanctions, ranging from a written reprimand to termination of RCCC membership, or indeed 'Any other sanction(s) deemed appropriate in the circumstances'. The stakes then are high. Munro and Wilson's future participation in the sport. Brown's credibility to continue as National Coach. Will we know anything immediately after the Conduct Panel first hearing next Monday, or even before the Royal Club AGM on June 14? This is not likely, as the procedures say, 'No publication of a decision or sanction shall take place until the time for appeal has expired or an appeal has been decided.' And the Ethics Manual has an appeals procedure, with timelines. But if it goes to appeals, any anouncement could be delayed considerably. What concerns me is that nowhere in all this has there been the promised 'independent enquiry' into what went wrong in Vernon - why it happened, and what lessons can be learned so that such a thing never happens again. That's what curlers in Scotland want to know. I asked RCCC Board Chairman Mike Ferguson where we are with this. He says, "After the proceedings are fully complete, the Board will be conducting a comprehensive review, seeking advice as required. I am sure you can appreciate timings cannot be confirmed at this stage, however both the recommendations and any subsequent alterations to our procedures will be published." 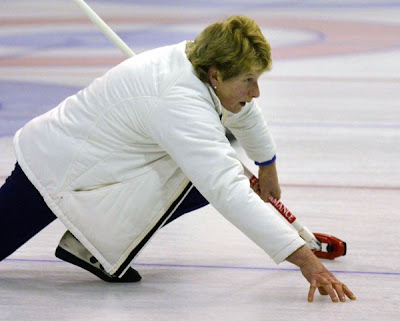 International seniors' curling is set to return to the Greenacres rink in Renfrewshire next season. 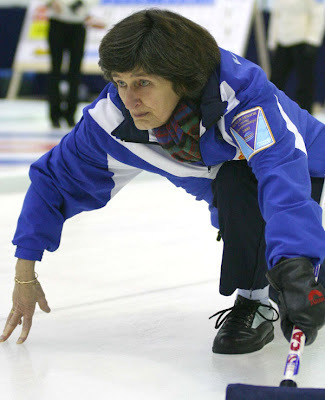 The first European Seniors' Invitation Curling Championships come about as a result of the World Women's and Seniors' Championships held in Paisley, in 2005. The financial side of the events was astutely managed and the Local Organising Committee was left with a financial surplus to use for curling development in the West of Scotland. This legacy has already allowed Braehead to hold the Glynhill Ladies WCT-e event in January. The Greenacres rink, where the Seniors' games were held in 2005, will hold the inaugural European Seniors' Invitation events in October. Invitations have been issued to all member nations of the European Curling Federation asking, where possible, that they give their men's and women's champion teams from last season the opportunity to take part in this first International competition for Seniors in Europe. The official announcement is posted on the European Curling Federation's website here. In addition to the legacy funding which the event will receive, Greenacres is to contribute further sponsorship. ECF President Malcolm Richardson says, " There is no doubt that this is an exciting development in Senior curling and we trust that the event will be a great success." Regular readers of the blog will remember that it had been hoped (see here) to hold the event last season, but scheduling difficulties caused it to be postponed. It is great news to hear that the competition will go ahead this year. 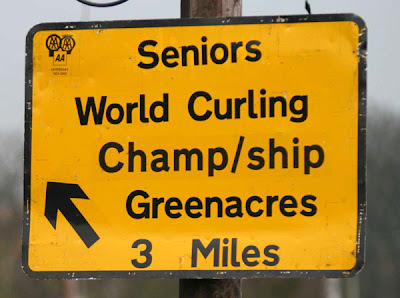 The pic is of a sign on the road to Greenacres during the World Seniors in 2005.